I could probably grow old drinking exactly what's in my cellar now and be perfectly happy. 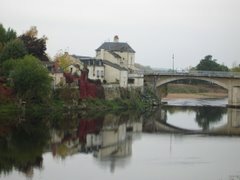 I mean really - Burgundy, the Loire, Sherry, Champagne...what's not to love? It's important also to drink things from time to time that are outside of the comfort zone. I do not do this very often, and I need to do it more. There is no deep thinking behind this - it's just good to experience new things, to explore a bit, to practice being open-minded. So, I am making a conscious effort to drink wines I don't know. Nothing major, just making an educated guess on wines here and there, nothing expensive. It's funny - I used to do this all the time maybe 5 years ago. Now I've gotten to a point where I feel like I understand what, for me, is the optimal way to spend every wine dollar, and maybe too much so. I never find myself saying anymore "Hmmm, that looks interesting, I'm going to give that a shot." So I'm trying to do this again. This past month I bought two wines that are new to me and both, I must say, were excellent wines, things I would definitely buy again. 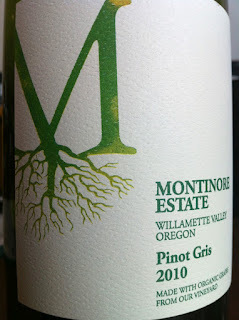 I drank an Oregon Pinot Gris and I really liked it. 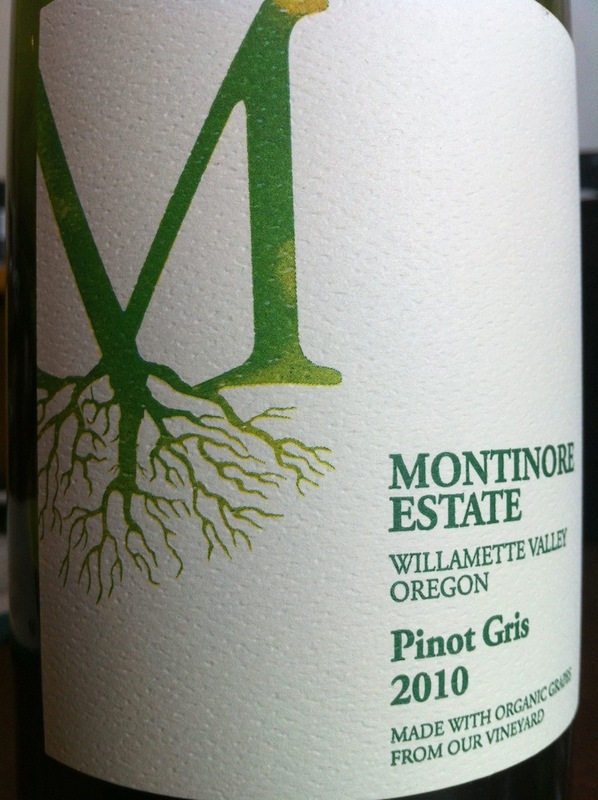 Now, if you've been following this blog for a while, you know that I used to drink a lot of Oregon Pinot. My tastes changed, I stopped buying and drinking the wines. 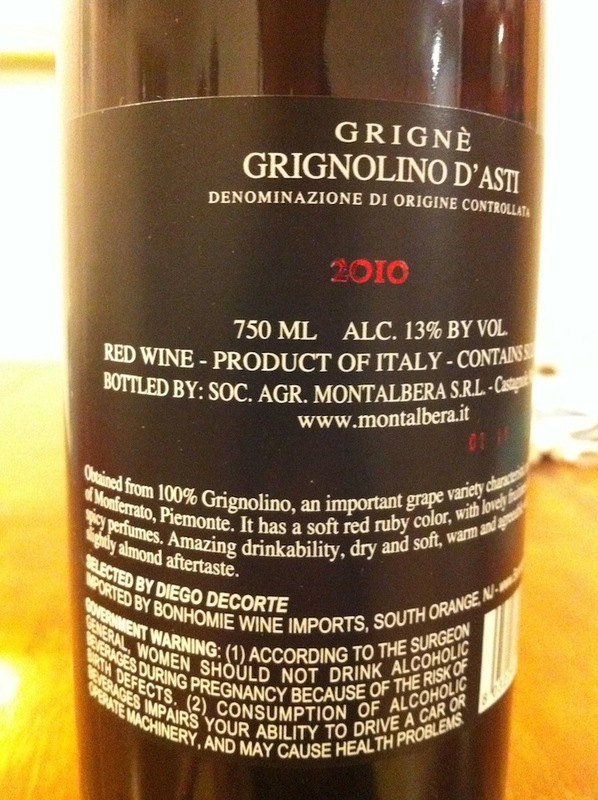 But one day in February I was browsing in a large Manhattan store in which I don't normally shop, and I saw bottles of 2010 Montinore Pinot Gris on sale for just under $11. 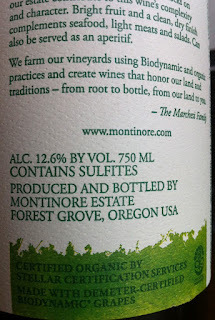 I haven't liked a lot of Oregon Pinot Gris, but I remember hearing that Montinore is a good producer, and the back label says the wine is 12.6% alcohol and the wine is made using Demeter certified biodynamic farming methods. I bought one bottle. Honestly, the wine was really good. It was clean and bright tasting, relying on a lean intensity. 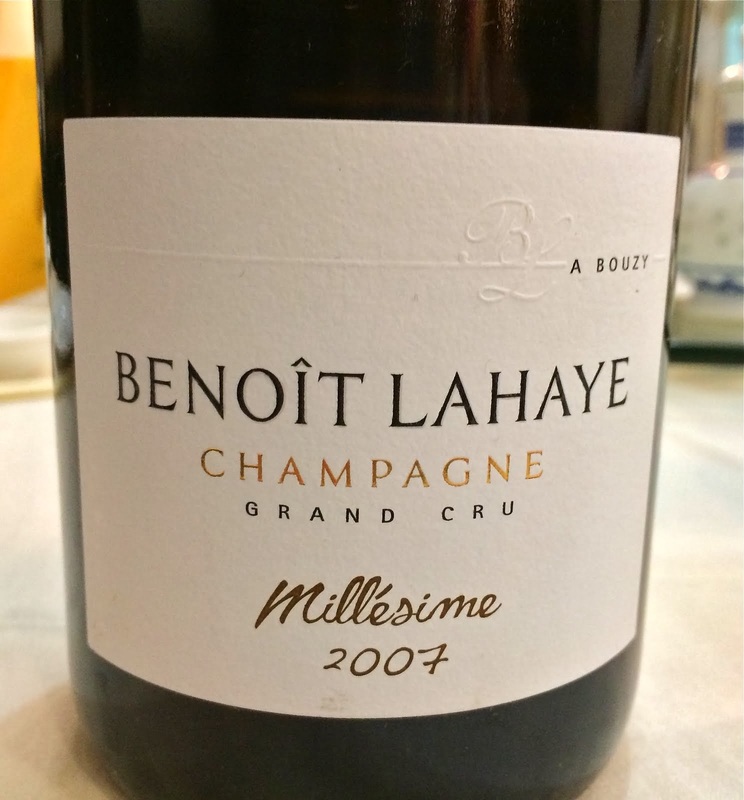 There is ripe fruit - spiced pear and apple, there is a definite mineral sensation, and the finish is long and pleasingly bitter. This is delicious wine, and not because it resembles an Alsace Pinot Gris - it doesn't. 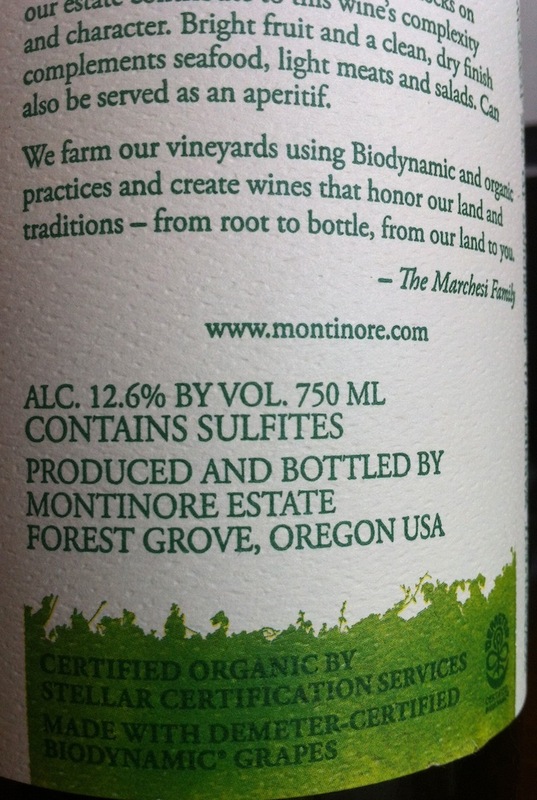 It's an Oregon wine, no mistaking that. And it's a really good one. It didn't hold up well overnight - probably not meant for the cellar, but it is a quality wine, and it would be nice if there were more Oregon wines like this, where the producer doesn't try to do too much in the vineyard or the cellar. Another new one for me, this time a red wine. It was during the Super Bowl, I think, when my pal poured me a glass of something that looked like rosé. 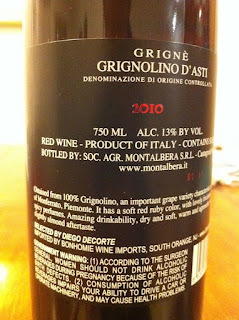 It wasn't rosé though, it was Grignolino d'Asti. Wow, so good - fresh and vibrant and eminently drinkable, red fruit and flowers, and complex too. 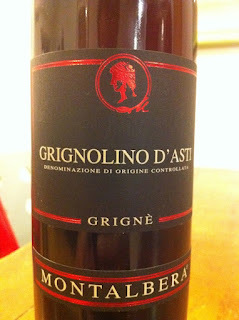 I'm talking about the 2010 Montalbera Grignolino d'Asti Grignè. When I looked for it at the store I saw that Charlie Woods of Bonhomie Imports brings in this wine, and I wasn't surprised at all. In keeping with his other wines that I know, this is very reasonably priced ($15-18), and it feels old school, and very pure. I've had a few bottles now and I really like the wine. 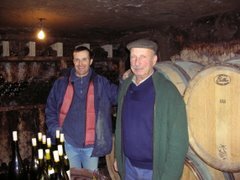 I like to drink it cool - cellar temperature, as you would a Beaujolais. The floral and spicy characteristics come out best that way. It's great with charcuterie or lentil soup, or most anything really, and it does drink well on its own. I had a bottle with a spread of Middle Eastern food and it was an excellent partner for the chickpeas and spinach, and also the Merguez sausage. This is a very light colored wine, like a Poulsard, and as with good Poulsard, the wine has great structure and sneaky intensity. Supposedly this is what you drink while you wait for your Barolo and Barbaresco to mature. 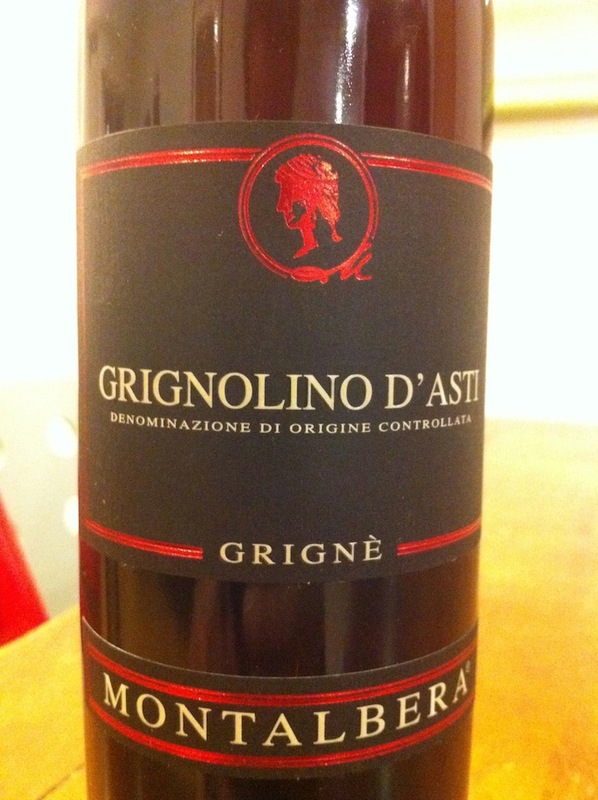 I can see that when I drink this wine, and although I've not had even one other example of Grignolino, I'm not sure that I need to because this one is so very good. Forcing myself out of the comfort zone...so far so good. 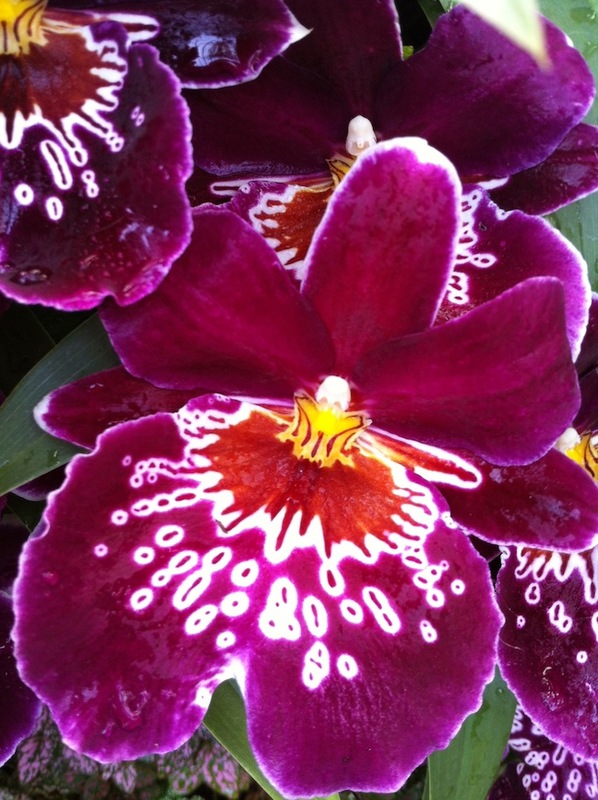 The New York Botanical Garden in The Bronx is a real gem, as honestly are each of NYC's botanical gardens. 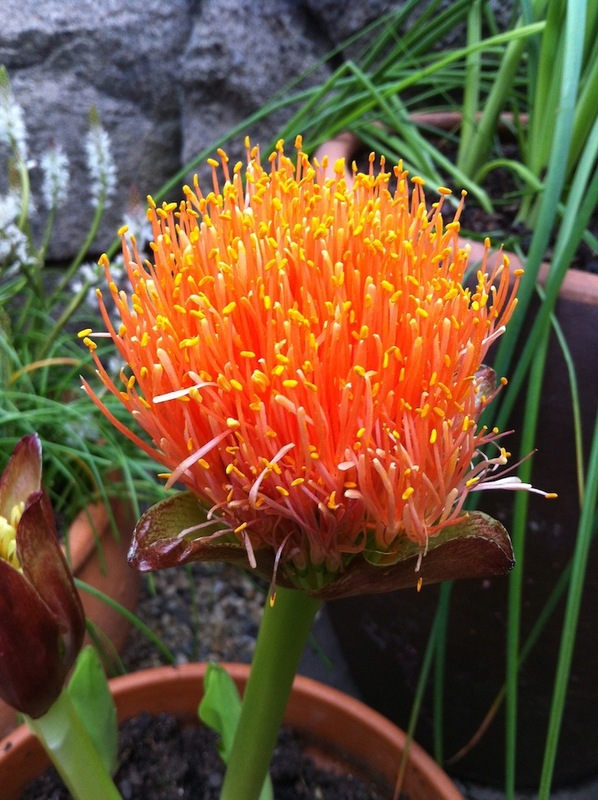 I'm obviously partial to the Brooklyn garden, but Staten Island's is not to be missed, with its one-of-a-kind-on-the-east-coast Chinese Scholar's Garden. 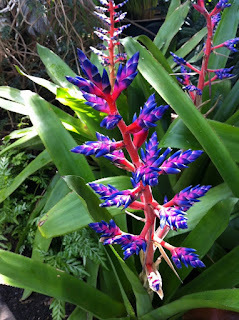 The garden in The Bronx also has its charms. It has what I understand to be the very last bit of old growth forest in New York City, for example. 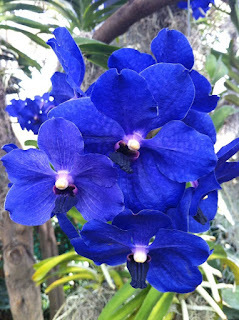 Spring is a great reason to visit any of these gardens, but on top of that there is an absurd orchid show at the garden in The Bronx, through April 22. I'm telling you, this is worth the trip. 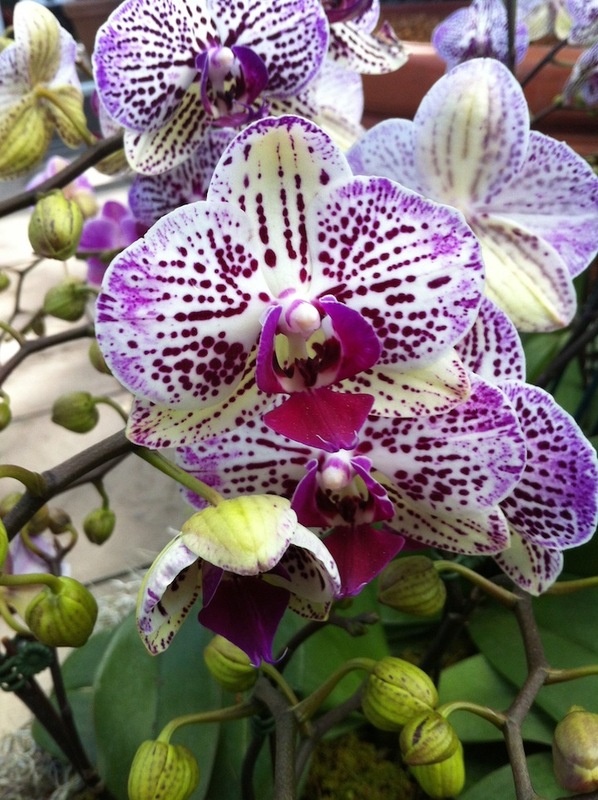 Some of the orchids will make you blush. These cannot be possible. But they are. And it's not all orchids. 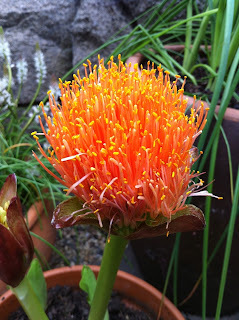 There are orange-haired flowers. 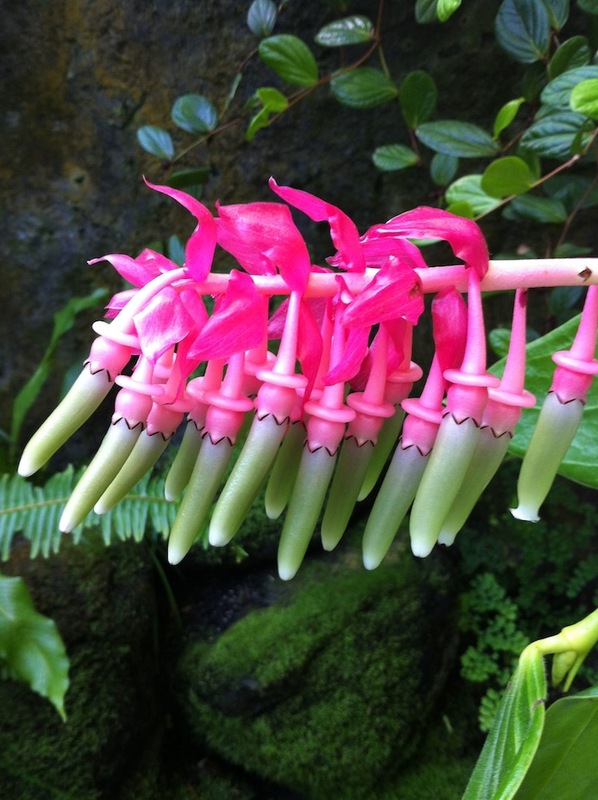 I'm not fully convinced that these are real flowers. There are space alien flowers, too. And because we are people whose real reason for doing anything is actually the eating and drinking part, after the garden you can walk (maybe 20 minutes) to Arthur Avenue, the main drag in Belmont, the Little Italy of The Bronx. This place blows away the Little Italy in Manhattan, which at this point is not much more than a tourist trap. The bakeries, the delis, the cheese and antipasti shops, the restaurants...oiy vey! A buddy and I took our daughters on a recent Saturday to see the orchids and then to Arthur Avenue. We ate lunch at Dominick's. Calamari were among the very best I've had. 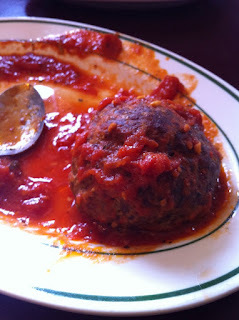 Fried perfectly, so tender, served with the best "red sauce" I've encountered. 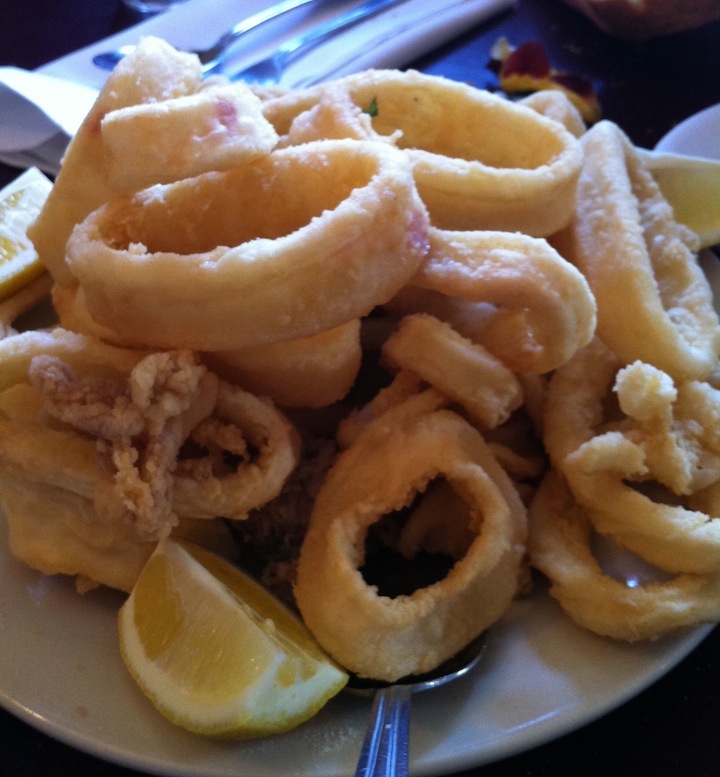 The calamari were seasoned beautifully, just the right amount of salt - they didn't need the tomato sauce. But the tomato sauce was so very very good, it was hard to know what to do. 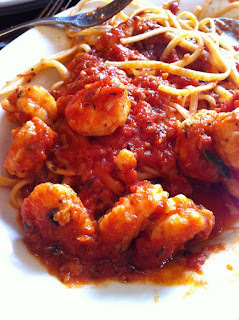 Linguine with shrimp and marinara sauce was also excellent. Two of the three meatballs vanished in the 4 seconds that it required to take this photo. If you go, make sure to visit Mount Carmel Wine & Spirits on 187th Street. Chambers Street Wines, this isn't. All I'm saying is that you'll be surprised and excited by what you find in the Piedmont section. This video, about 3 and a half minutes long, shows Sandro Piliego of Palo Cortado slicing Jamon Iberico, and discussing Jamon and Sherry. I shot the video on my phone and of course forgot to turn it sideways, so sorry about the rather narrow picture. 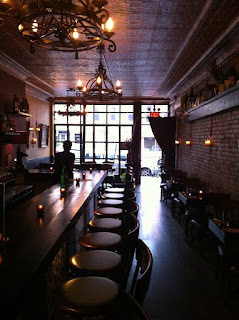 I want to tell you about my favorite place to drink Sherry in NYC, a tapas bar called Palo Cortado. 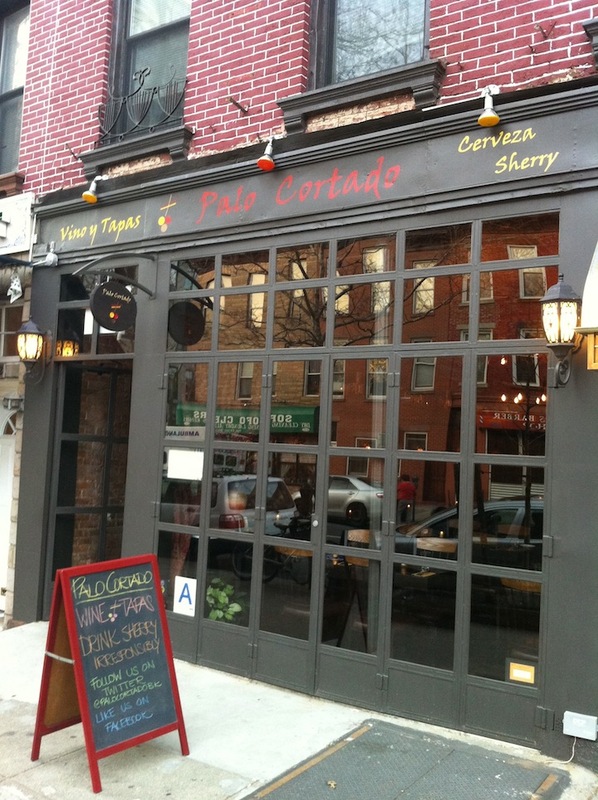 Palo Cortado is actually a restaurant with a full menu, and it serves a wide and interesting selection of wine and beer. 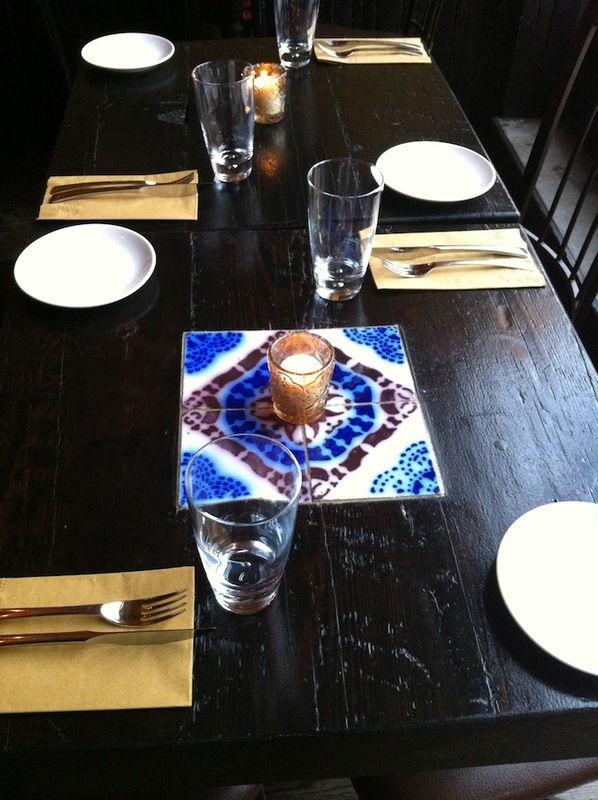 You can go there and have a "normal" restaurant experience, with an appetizer, an entree, and dessert. 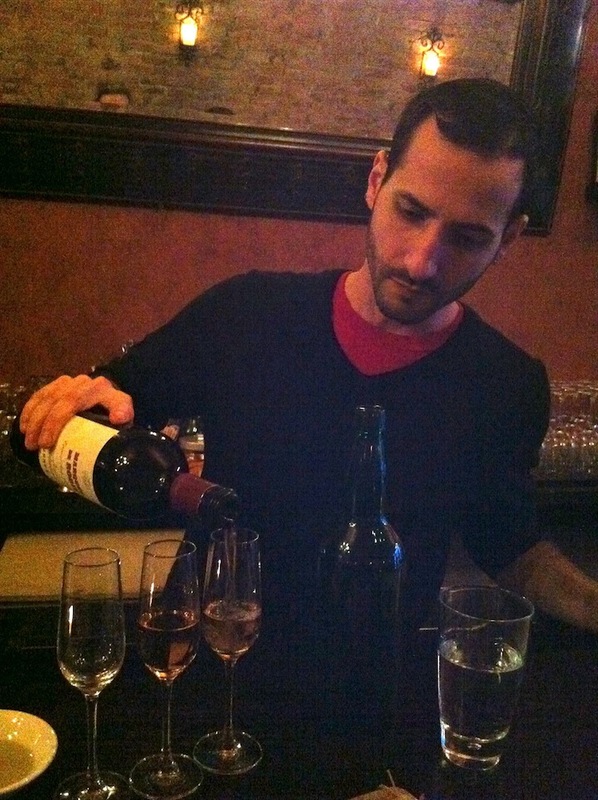 But I'm going to talk about Palo Cortado in the way that I experience it, as a tapas bar. Let me start by saying this: Palo Cortado has as good of a by-the-glass Sherry list as anyplace I've seen. 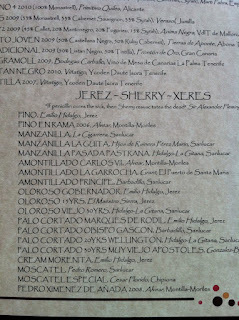 There are about 20 Sherries on the list at any time, and wines rotate in and out. This is a place where you can drink interesting wines in each category of Sherry, wines that can be quite difficult (in some cases, impossible) to find on retail shelves. 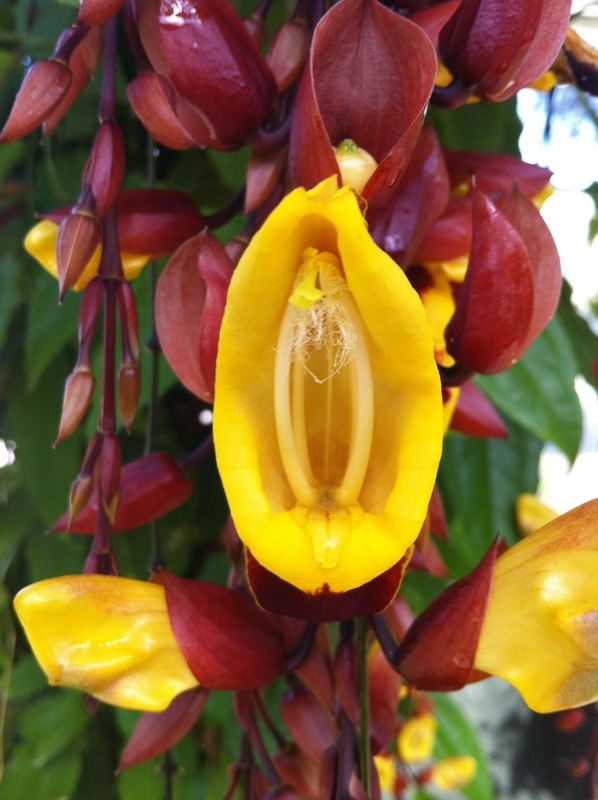 There are lovely Finos and Manzanillas, interesting Amontillados and Palo Cortados, and several examples of Moscatel and Sweet Pedro Ximenez wines too. The most expensive wine I've seen, I believe, is the Bodegas Tradición Amontillado at perhaps $20 a glass. 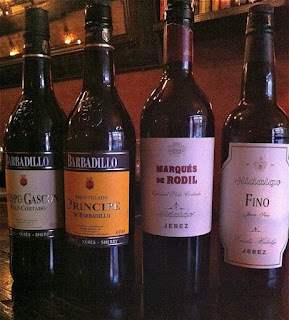 That's right - you can drink things like Bodegas Tradición Amontillado, by the glass, at Palo Cortado. The least expensive is the extremely delicious Emilio Hidalgo Fino at $6. Think about it - you can sample Sherries of all types for very reasonable prices, play around, try new things, expand your understanding of this forgotten (but perhaps now re-discovered) great wine of the world. The wines are served in Sherry glasses and this is a great decision, particularly with the brown Sherries. I think Amontillado and Palo Cortado wines show best in these copitas, benefiting from the focus the glass confers. I prefer the way Fino style wines smell and taste out of white wine glasses, but copitas are fine too, and it certainly feels more like a tapas bar that way. Alessandro Piliego (pouring, above), who goes by Sandro and is one of the owners of Palo Cortado, is a true believer, and will be happy and excited to pour various wines for you, to talk about them with you, to support you in exploring the bottles he offers. If you go, you should talk with him - you will feel as though you have been well taken care of. Palo Cortado is a destination place, it's worth traveling to because of the great Sherry selection and the great service. The food can be good too - there are dishes that I love to eat at Palo Cortado and I always enjoy my meals there. But the reason to travel to Palo Cortado is the great Sherry and the great service, and there are also some good things to eat. And I should say that I've never tasted even one of the main dishes. I order tapas, that's it. 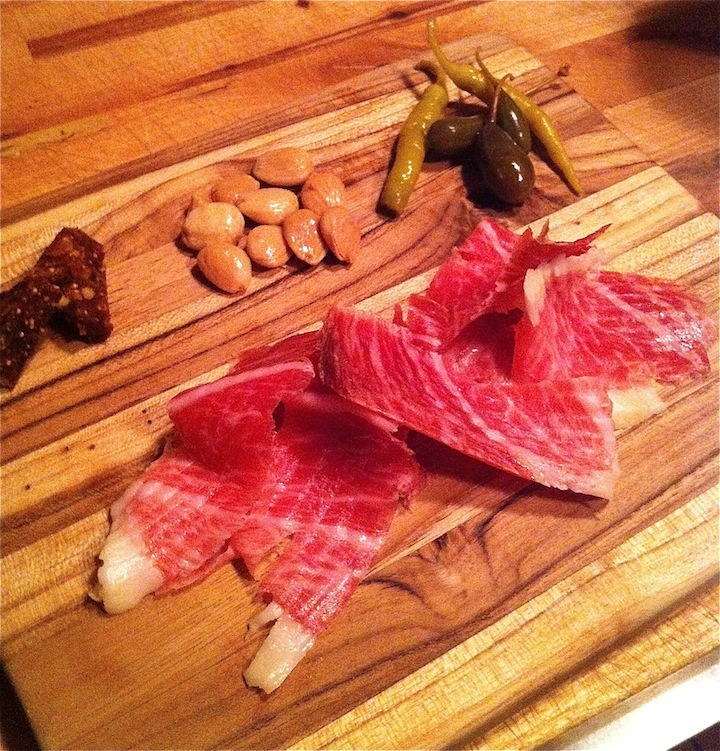 To me, the most delicious and very best thing to eat at Palo Cortado is Jamon Iberico. Sandro simply does this right, no question about it. High quality jamon, aged two years, cut by hand into thin (but not too thin) toothsome and highly perfumed slices. 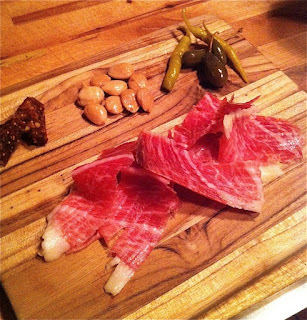 A plate of jamon is served with large caper berries, Marcona almonds, fig bread, and pickled Basque peppers. 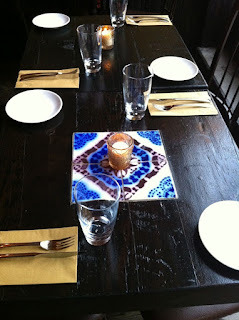 A little bread on the side, a nice glass of Sherry...what could be better? I usually drink Palo Cortado with the jamon, like the wonderful Emilio Hidalgo Marqués de Rodil, but Sandro recommends Fino, and I tried this last time and it was great. The other tapas that I always enjoy at Palo Cortado include Pulpo a la Gallega (tender octopus and potatoes with vinegar and lots of pimenton), Empanadas, which are completely home made and stuffed with delicious flank steak and melted Tetilla cheese, Patatas Bravas (fried potato chunks in pimenton and aioli, the Tortilla a la Cazadora (mushoom and potato omelet), the Albondigas de Cordero (lamb meatballs) and a frequent special of fluke crudo with grapefruit. 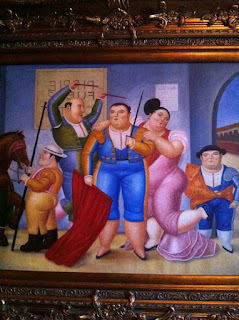 And if you think about it, along with the spectacular (I would say, best in NYC) Jamon Iberico, that's plenty of tapas. Order a plate or two with a copita, and when you and your friend finish, order another plate or two and another copita, and continue until exhausted or the bar closes. Another thing I appreciate about Palo Cortado is that it actually reminds me of being in Jerez. Okay, every tapas bar I can think of in Jerez and surrounding environs shows you many of the tapas you can order - they sit under glass and are served from troughs as you order them. That's not going to happen here, and that's fine. But the decor is right at Palo Cortado. Not too dark, not bright at all, some interesting paintings around, and they perfectly hit that critical mix of giving you enough space and somehow maximizing the hum of conversation from other tables. And there is tile. 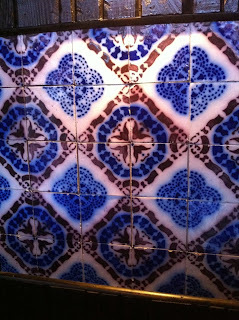 Tile at the bar. 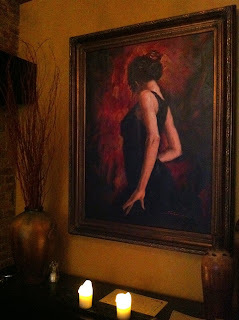 You can always walk around and look at the paintings if you like. Or sit at a table near the sultry painting in the back. If you are interested in Sherry, and want to go beyond La Bota, go check out Palo Cortado. It might be a bit of a trip for you, yes. But you like Sherry, you're interested and curious. It's more than worth the trip. You will have a great time here, trust me. And you will eat a glorious plate of Jamon Iberico that really tastes nutty like acorns and has a truly inviting and complex aroma. Careful, you might order a second plate. Or perhaps just return on another night and do it all over again. That's what I do. 520 Court Street, Brooklyn, between Huntington and Nelson. The Worst Wine and Food Pairing in History? Got home late at night from a business trip. Tired, malnourished, mal-slept, dirty from airplanes. Hungry, very hungry, and thirsty too. In the fridge - leftover spaghetti and meatballs. I made this, but it was four days earlier. Still pretty good. Served with the final third of a 375 ml bottle of 2003 Chateau Rieussec. This was opened three days earlier when a friend brought it over for dinner, and since then it sat in the door of the fridge, uncorked. That's right...spaghetti with meatballs and Sauternes. Perhaps the worst wine and food pairing in history. If you think you can do better, let's hear it. Probably the spaghetti would have benefited from being warmed up.